Our thermo-groove Six Seal System® enhances thermal performance and significantly improves the sealing capabilities of the tongue-and-groove joints between the logs. The thermo-groove Six Seal System® is available on our 8″ x 12″, 10″ x 12″ and 12″ x 12″ logs. This tongue-and-groove technology is designed with six channels to accommodate the butyl rubber tape sealant and asphalt impregnated foam gasket tape, with outside channels are angled to accommodate the butyl tape. During construction, this unique angle prevents the butyl tape from falling off while setting the log above and increases the seal from 1/4″ to 3/8″ since we use the diagonal of the butyl tape instead of the width. This increases performance without the extra cost of a 3/8″ seal. 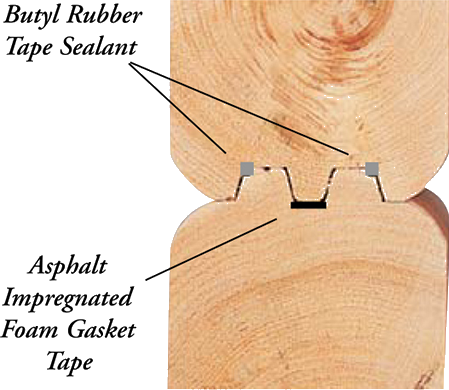 The channels prevent the sealant from being completely flattened by the upper log; therefore, when movement occurs in the logs enough sealant is still able to flex. The remaining four channels are designed to accommodate the asphalt impregnated foam tape, which provides insulation value and is waterproof when compressed 50%. 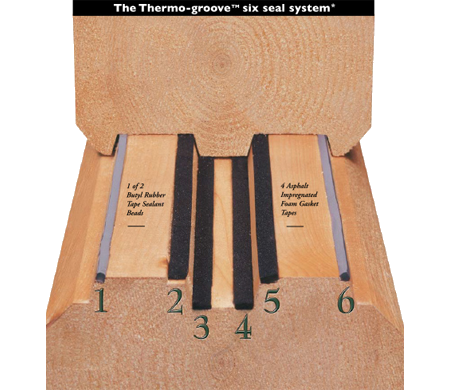 The thermo-groove Six Seal System® enhances thermal performance and significantly improves the sealing capabilities of the tongue-and-groove joints between the logs. The performance is similar to a thermal pane window: if the six seals represent six panes of glass, the trapped air space between the glass will act as an insulator. Each section of dead air space between the tongue-and-groove seals reacts in the same way—improving thermal performance. The original three seal tongue-and-groove system is used with our 6″ x 12″ log construction.